Effective organization is the most important part of my simplified workflow because nearly all my photos are part of various sequences. The most common sequence I use is bracketing. I use the Auto Bracketing functionality of my camera to automatically take three consecutive shots of the scene. I select the exposure values for the “base” exposure and the camera takes two more shots—one at a higher exposure value and another at a lower. Auto Bracketing achieves two objectives for me. First, it serves as insurance if I incorrectly set the exposure for the “base” shot. In case this happens, I always have two additional versions of the shoot to choose from. The second reason for bracketing shots is to ensure I collect as much information from the scene as possible. In case the dynamic range of the scene is too extreme, I always have the option of using the HDR technique to combine the three bracketed shots. Another type of sequence I frequently use is the HDR sequence. This is when I intentionally take between three and seven shots with the end goal of merging them into an HDR image. Most often, I use HDR sequencing when I shoot directly into the sun and am absolutely certain the dynamic range of the scene exceeds the dynamic range of the sensor of my camera. I use another type of sequencing when I want to achieve the effect of long exposure without using ND filters. I take a sequence of 10 to 14 shots with identical exposure values. The goal here is to combine them digitally in Photoshop to achieve the motion blur effect of long exposure. You can learn more about this technique in my tutorial: Long Exposure Effect Without Any Filters. Another popular photo technique that requires taking a series of photos is a panorama. Depending on the scene, the panorama sequence can have anywhere between 2 and 20 or more shots (Tutorial: Combining 12 Shots into HDR Panorama). The last type of sequencing I use is when I create Time Lapse videos. I program the camera to take a series of shots (hundreds) at predefined intervals (1-3 sec) so I can later assemble them into a video. In rare cases when I do not bracket my shots, I manually take multiple photos of the same scene to ensure I have an option to select the best and the sharpest image. Overall, the way I use different types of sequences directly affects the way I organize and edit my photos. It is not uncommon when I return from one of my photo trips to discover I have 5,000 or more photos to import into my Lightroom catalog. When importing is complete, the Library View is pretty messy and chaotic. It is hard to visually distinguish where one sequence ends and another begins. Thankfully, Lightroom has an easy way to make sense of the chaos. 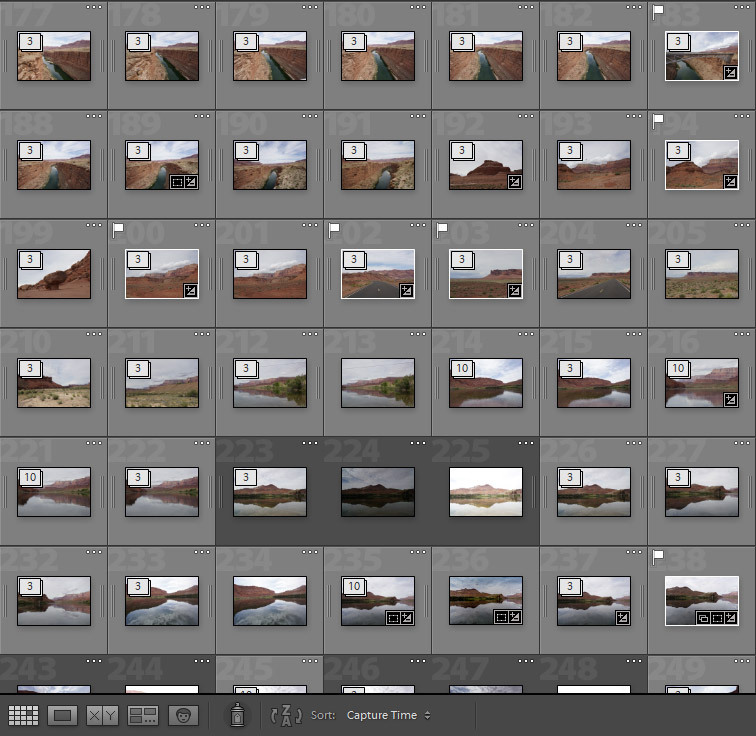 Lightroom has one of the most useful organizational features called Stacking. This is when you select multiple photos in your Library and add them to a virtual group known as a Stack. This functionality works well for a small number of photos but, if I start manually creating Stacks for 5,000 new photos, it would easily take a few hours. 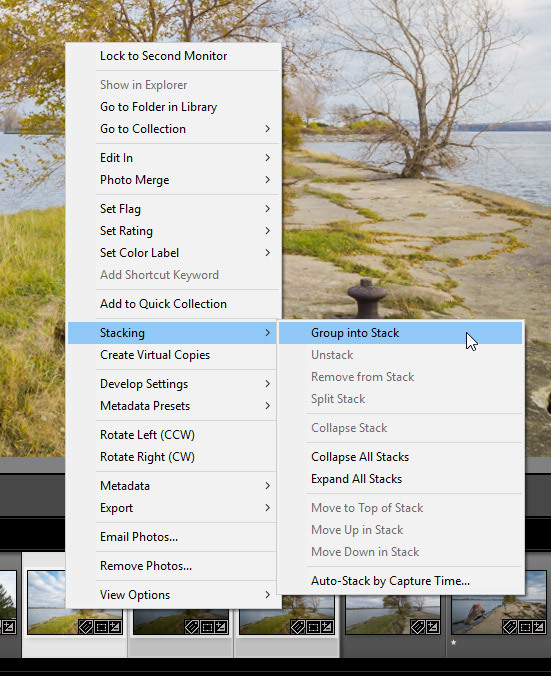 Luckily, Lightroom has a feature that can automate the process of organizing photos into Stacks. This is called Auto Stacking. In the Grid View of the Library module, I select all the newly imported photos (Edit > Select All). Next, I Right Click/Option Click anywhere inside of the Grid View and select Auto Stack by Capture Time. Now, I have the option to group or Stack my photos based on time intervals. By dragging the time slider, I see the estimation of the number of Stacks based on the time selection. When I know I have only short sequences in my selection (brackets and HDR), I usually select two second intervals. When I know I have longer sequences of eight to 12 shots (the long exposure effect), I select time intervals of 15 seconds. And, in rare occasions when I have a very long Time Lapse sequence, I do not use Auto Stacking at all. Instead, I manually group them into Stacks. 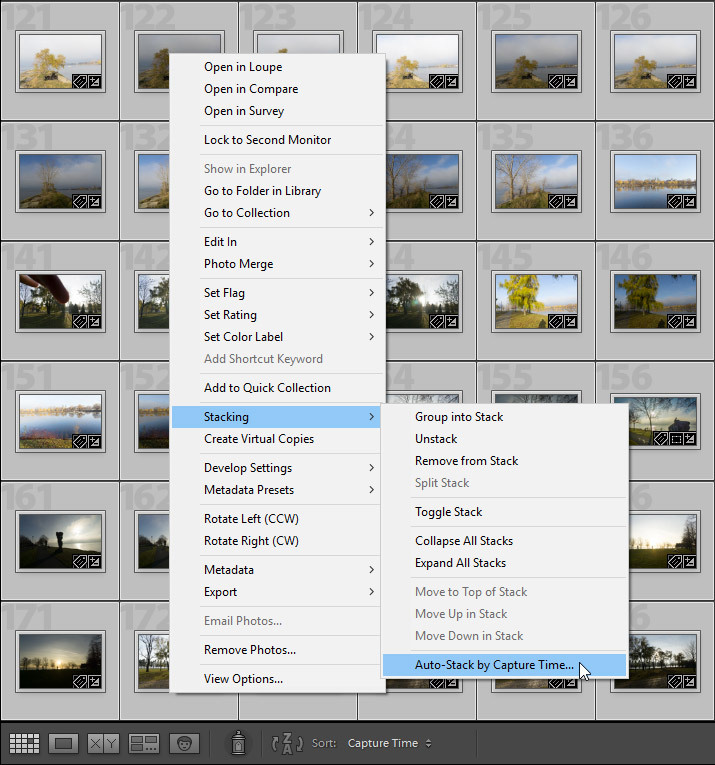 After the time intervals value is selected, I click the Stack button and Lightroom does its job. The last step is to select the Collapse All Stacks option for a more compact view of the Library. As with any automated feature, Auto Stacking is not bullet proof. It gets everything right in 90% of cases and, occasionally, requires some manual tweaking to assemble all the photos into the right Stacks. 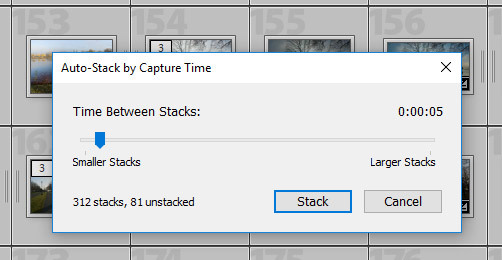 Auto Stacking is a seemingly obscure and nonessential feature in Lightroom that has a significant impact on streamlining and simplifying my photo organization and editing. Good tip I have not tried the stacking feature in lightroom. I will have to check it out. I suggest starting with manual sacking by organizing individual photos into logical groups. Thanks Viktor this is realy a good eye opener. What does LR do with the single (non-bracketing) shots ? Are they put seperately in a folder ? The unstacked pictures are left as standalone in the filmstrip. This entire process doesn’t affect the location of the files. It is just a virtual process that helps the user to manage large volumes of pictures in Lightroom. I manually stack all of the time but never thought about the auto-stack with a very short time interval. Thanks for the idea (and step-by-step)!